The Northwest Caucasian language family is a family of languages that originated in the northwest part of the Caucasus. It consists of Abkhaz (with its numerous dialects, including Abaza) and Circassian (the two chief dialects of which are Kabardian (East Circassian) and Adyghe (West Circassian)). It used to include Ubykh, but that language’s last speaker died in 1992. The family is also known as Abkhaz-Adyghe. The Northwest Caucasian languages are still spoken in their native range (including Abkhazia, which is kinda-but-not-really part of Georgia, and thus within the purview of this blog), but today they are mostly spoken in Turkey. This is due to the Russian Empire, which in the nineteenth century conducted a brutal campaign of ethnic cleansing (or genocide?) in the North Caucasus. Most Circassians, Ubykhs, and Abkhaz (who had been Ottoman subjects prior to Russian conquest) were forced into exile, resulting in a large diaspora. There are no monolingual speakers of Northwest Caucasian languages. Those in Turkey all speak Turkish, and those in Abkhazia and Russia all speak Russian. Consequently, there is a real possibility that these languages could cease to be spoken in the near future. Almost all the Ubykhs assimilated into Turkish society, and the rest were assimilated into other Caucasian groups. 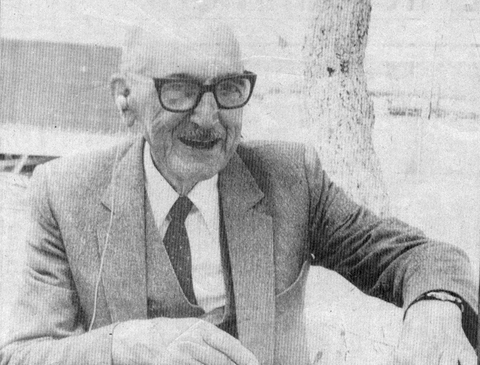 Tevfik Esenç, the last speaker of Ubykh, was fluent in both Turkish and Circassian. Phonologically, the Northwest Caucasian languages are unusual. Like Georgian and other languages of the Caucasus, the Northwest Caucasian languages feature the three-way voicing distinction of voiced / voiceless aspirate / voiceless ejective. Unlike those languages, these ones also include consonant-altering processes called palatalization and labialization. Roughly, palatalizaing a consonant means to raise your tongue in your mouth while saying it, so that it’s like saying the consonant while also saying “ya” (palatalization is central to Russian phonology). Labializing a consonant means to purse your lips while saying it, so that it’s like saying the consonant while also saying “wa”. Consonants of any voicing can be palatalized, labialized, or plain, leading to a wide range of possibilities. For instance, in English we have the pairing k / g (g is the voiced counterpart to the voiceless k). In Georgian, this is extended to k / k’ / g. In the Northwest Caucasian languages, there are nine of these — k / ky / kw / k’ / k’y / k’w / g / gy / gw (superscripted y and w mark palatalization and labialization). In this way, these languages generally have around fifty consonants, and Ubykh had more than eighty consonants. On the other hand, none of the Northwest Caucasian languages have more than three vowels, and usually only two vowels (one open and one closed). On some (highly disputed) analyses, they have zero vowels. It’s thought that this bizarre ratio of consonants to vowels came about by consonants “taking on the work” of vowels over time. The Abkhaz alphabet was designed by a committee. I’m not kidding. It’s hard to tell, because Abkhaz has had no fewer than six alphabets in its short history as a written language. The first was designed in 1862 by Peter von Uslar, the founder of modern Caucasian ethnography and linguistics, as part of his effort to document the obscure languages of the mountains. Though based on Cyrillic, Uslar’s alphabet pressed into service several letters from the Latin and Greek alphabets. The next was developed in 1909 by Alexi Chochua. Yeah, it’s another alphabet post. 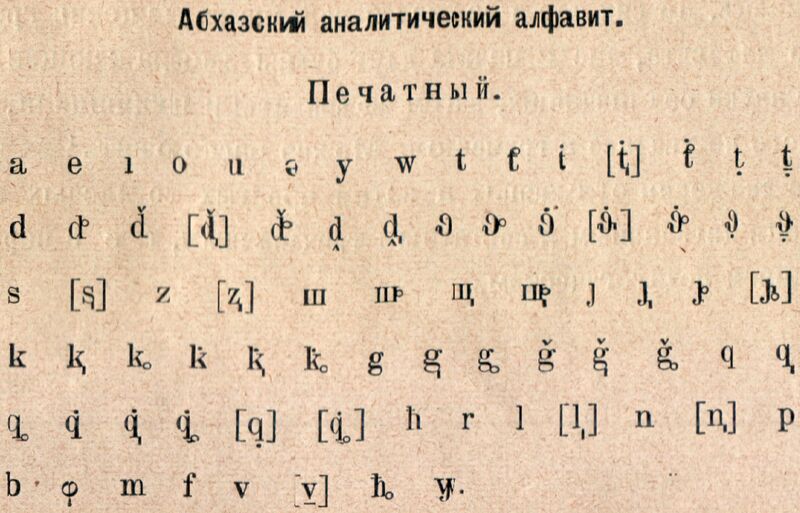 In 1926, Scottish-Georgian linguist Nicholas Marr devised his so-called “analytical alphabet“. Unlike previous attempts, Marr’s alphabet was based on Latin, rather than Cyrillic. Nevertheless, when the Soviets began their campaign to provide Latin alphabets for newly-literary languages, they used a different one. 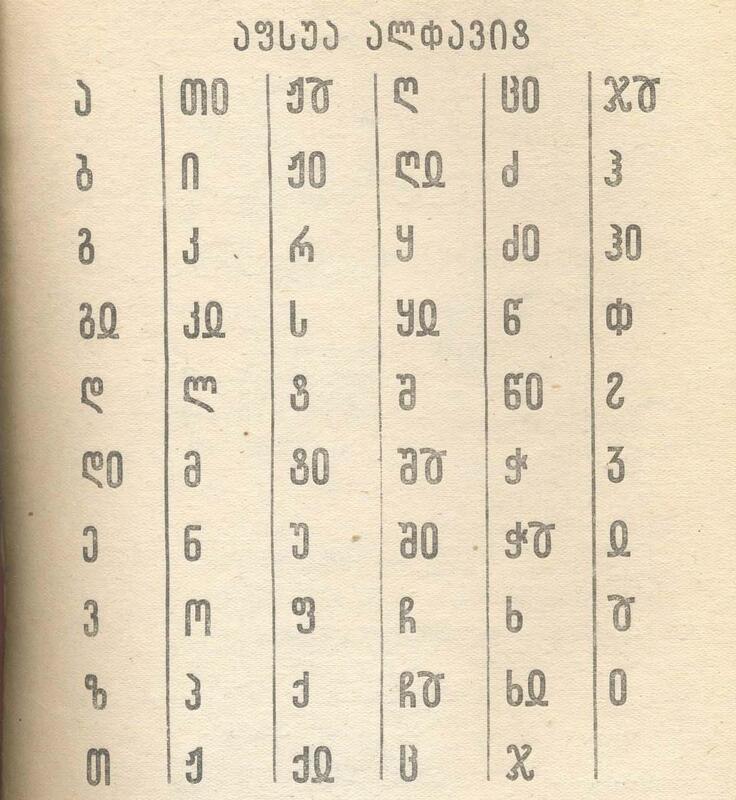 From 1938 to 1954, as we saw before, the Georgian alphabet was imposed on Abkhaz. After Stalin’s death, Abkhazians reverted back to Cyrillic. English Caucasologist George Hewitt has come up with a general proposal to Latinize the Northwest Caucasian languages, with an eye towards the Caucasian diaspora in Turkey who don’t know how to read Cyrillic. 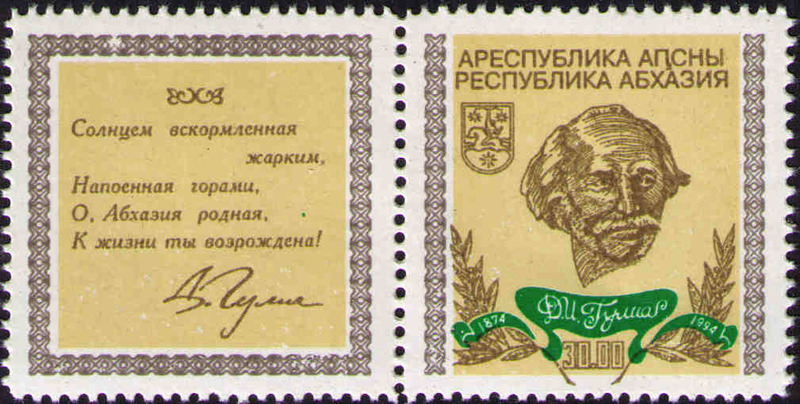 Lastly, the father of Abkhaz literature is Dmitry Gulia (Abkhaz: Дырмит Гәлиа). I don’t know if the other Northwest Caucasian languages have traditions of written literature. This entry was posted in History, Language and tagged abaza, abkhaz, abkhazia, adyghe, alphabet, caucasus, circassian, consonant, cyrillic, genocide, georgia, georgian, gulia, history, kabardian, labialization, latin alphabet, linguistics, north, palatalization, phonology, russia, russian, stalin, tevfik esenç, turkey, turkish, ubykh, uslar, vowel by georgiasomethingyouknowwhatever. Bookmark the permalink.